Let�s start with a little about Tobagan weather: Normally, from mid-September to mid-October the general Tobagan rainfall pattern is interrupted by days of brilliant sunshine; a climatic phenomenon we in the United Kingdom would call an Indian Summer -- it offers a warm, invigorating change to dull weather - Tobagonians fondly call this phenomenon Petit Car�me. In a two-acre valley surrounded by bamboo and grown with ancient Samaan trees. Petit Careme is situated in a gated community with security and four other villas tastefully placed to ensure guest privacy. The valley has 260 feet of golf front access with a beautiful view of the Mount Irvine Golf Course, coconut trees, and the Caribbean Sea in the distance. 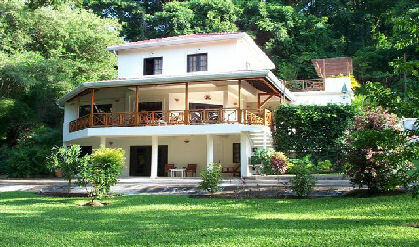 The Petit Careme Villa and Apartment are ideal for wedding parties and family reunions. The large landscaped grounds and main pool area offer many options and photo opportunities. The intimate lower apartment is suitable for newlyweds, or those with mobility difficulties. The villa comes fully equipped with all appliances. There is a daily housekeeper included within the rate who will also cook for a nominal fee. The large upper villa has 3,400 sq. ft./287 sq. metres of covered area. It has been built to facilitate tropical living with large ceiling fans throughout, but totally air-conditioned for your comfort if you so desire. There is a large front balcony surrounded by a valley which allows one to sit and enjoy the many species of birds right from the comfort of your arm chair, view the golf course or simply SIT, SIP and ENJOY. The first floor is built with an open plan design: the kitchen, dining room and living room flow into one large space all tastefully decorated with handcrafted furniture made from local woods of teak, mahogany, cedar, cypre, and tropical fabrics. In this area is a Cable TV and Stereo for your viewing and listening pleasure. The upper deck allows one to enjoy the sunsets and sunrises among the upper branches of the trees and view all our tropical birds at close range, or sun bathe privately or entertain with a delightful barbecue under the stars. On the ground level is a 1200 sq. ft./129 sq. metres, self-contained apartment comprising of a large bedroom, walk-in cupboard, fully equipped kitchen, and living room with stereo. This is fully air-conditioned. The bathroom is large enough to allow disabled access, being on the ground floor a wheel chair can easily move about the apartment and at the same time enjoy the pool and grounds with ease. And level access.